Raith progressed to the fifth round of this season’s Scottish Cup with a deserved win over hardworking Stirling Albion at Forthbank Stadium. Two goals either side of half-time from Barrie McKay and Grant Anderson – Raith’s best players on the day – reflected the difference in quality between the sides. 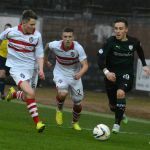 Although when the fourth-round draw was made, this looked like an awkward tie, and although a succession of missed half-chances meant Raith only took the lead a moment before half-time, ultimately manager Grant Murray will reflect on a relatively comfortable passage through to Monday’s draw for the last sixteen of this season’s competition. 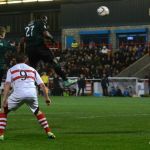 Both sides found themselves in the fourth round of the Scottish Cup having survived traumatic experiences at the hands of lower-league opposition. 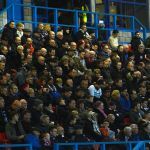 Raith had suffered for long spells against non-league Linlithgow Rose, with the West Lothian side creating the better chances over the ninety minutes. 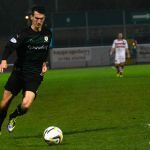 Stirling required a replay and a Cup-record twenty-eight penalties to see off Ayrshire’s Hurlford United. If the result of today’s game was to be described as a “giant-killing”, supporters would surely appreciate the irony given both sides’ struggles in the previous round. 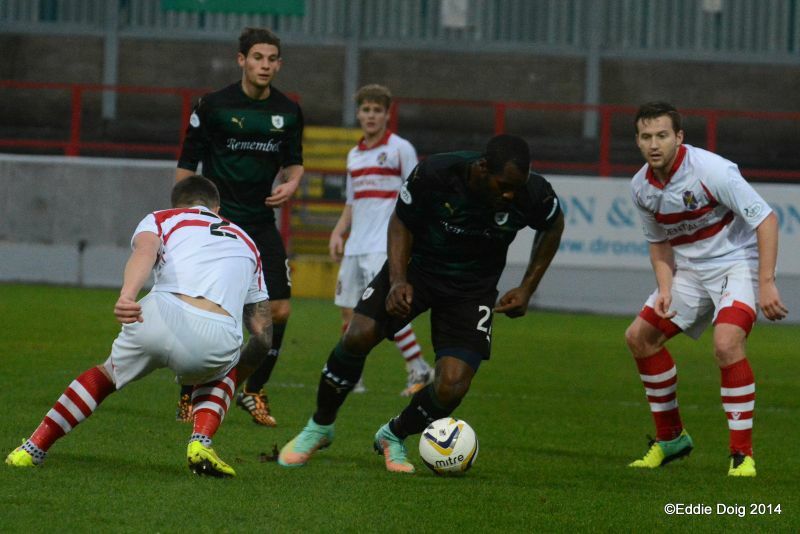 The Raith midfield saw Liam Fox out, and Jimmy Scott paired with Kevin Moon. 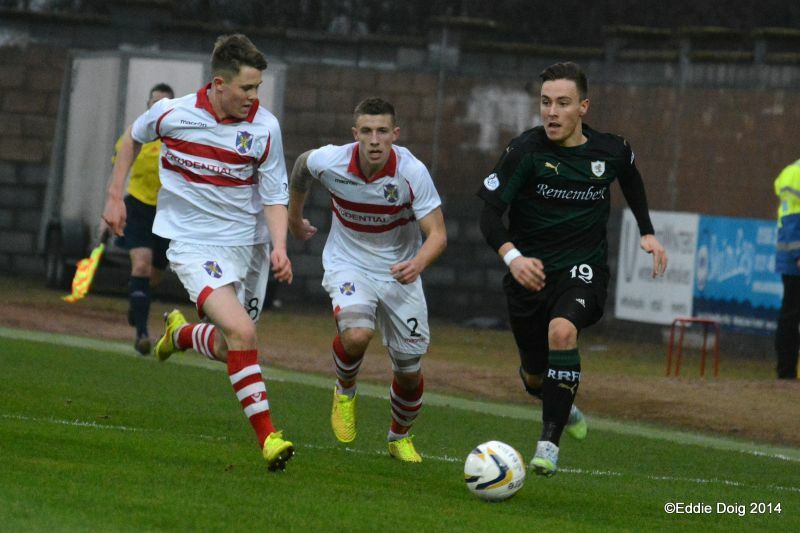 Mark Stewart started alongside Christian Nadé, and Barrie McKay and Grant Anderson on the left and right flanks. 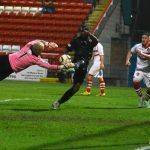 Dougie Hill took a place on the bench, no doubt keen to get back to first-team action after his lengthy absence through injury. 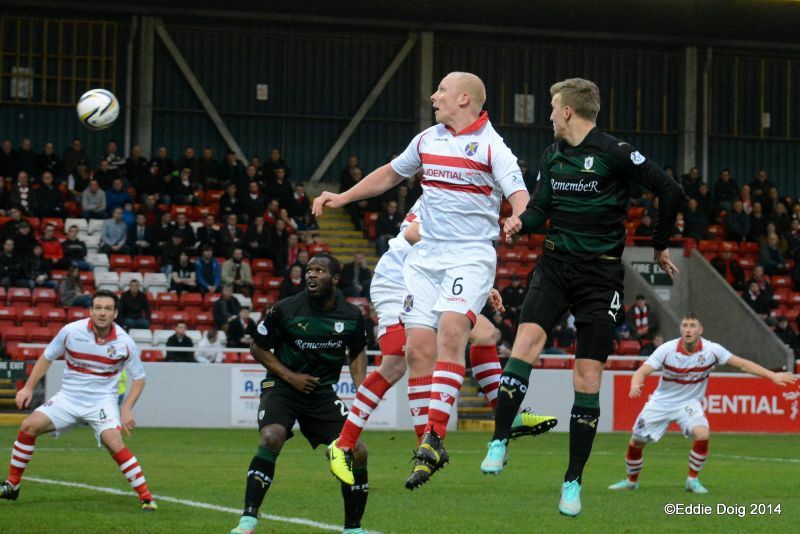 Stirling Albion sit at the foot of Scottish League One, without a competitive victory since late August. 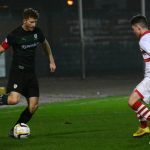 New manager Stuart McLaren – a former Albion player – set out a side with attacking intent – strikers Doris and Cunningham in front of a youthful midfield containing seven-goal Gordon Smith. 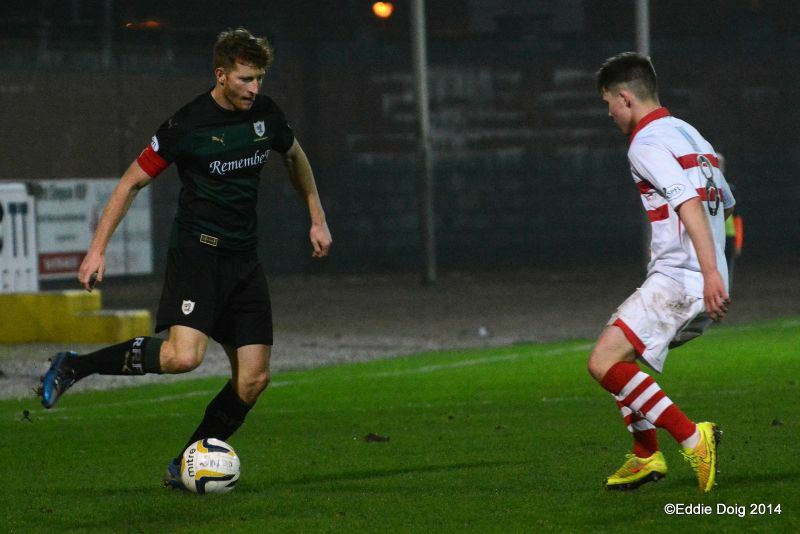 With league form poor, the Binos had all the more reason to seek a morale-boosting Cup victory. A lovely sentiment greeted the teams on their arrival before kick-off – the Scotsport theme tune played over the stadium tannoys to celebrate the life of Arthur Montford, who passed away this week. The tune’s uplifting samba motif stood in contrast to the grey skies which clouded the Forth Valley. The match started brightly, with no fewer than five clear shots on goal in the opening ten minutes. 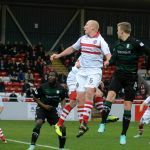 Stirling offered a sharpness and vigour which unsettled Raith early on – a Smith header worried McGurn in the first minute. Raith, clearly intent on establishing themselves early, set their wingers after their respective full-backs from the off. McKay and Anderson were clearly instructed to get “chalk on their boots” – Kevin Moon also looked to get the ball wide via his full-backs at every opportunity. 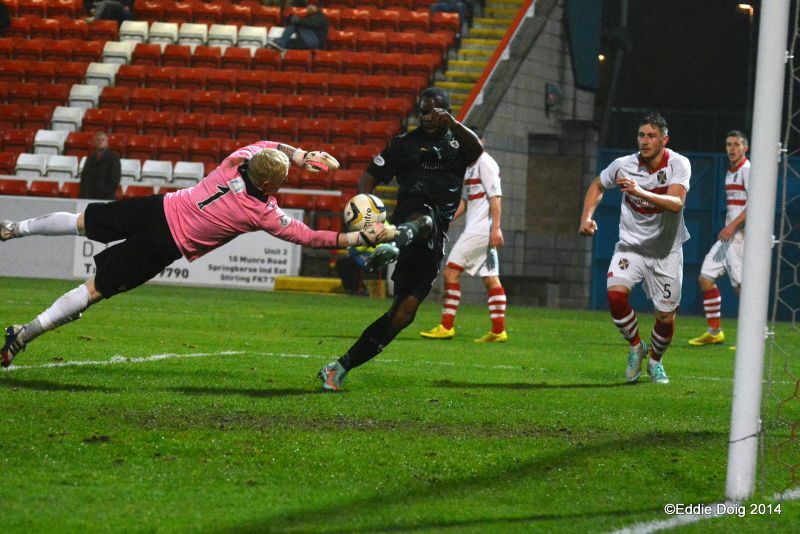 Anderson’s cross found McKay, whose shot was deflected clear by Stirling keeper Reidford. 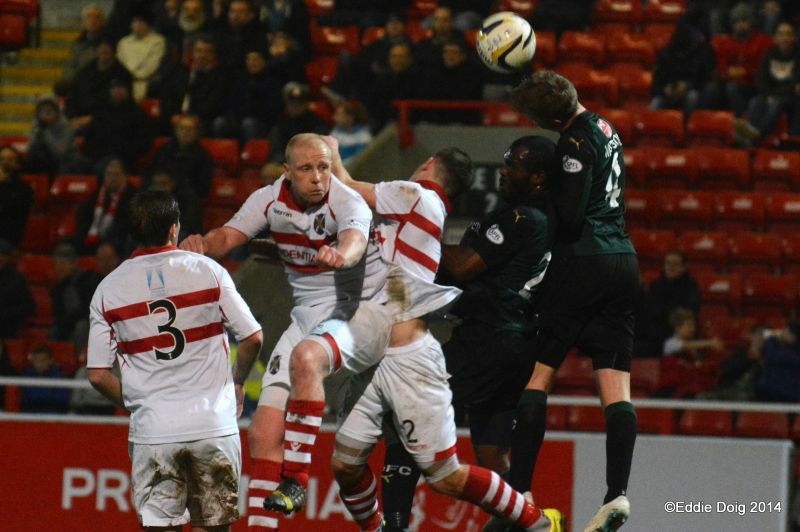 Soon after, Scott’s rising drive from McKeown’s long throw whistled over the bar. 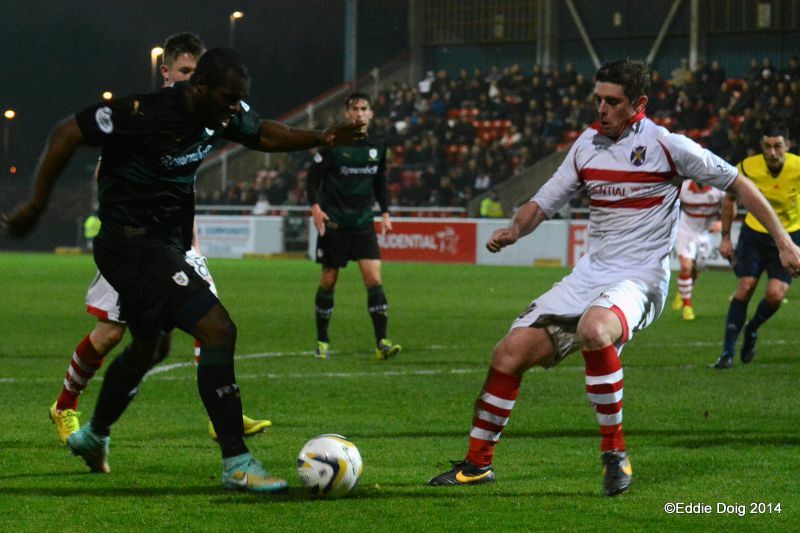 In the fifth minute, Nadé forced his way past home centre-half McGeachie, and was rewarded with a corner. Paul Watson was inches away from Stewart’s centre. Moments later, Anderson saw space in front of him, and blasted over from twenty-five yards with others alongside. 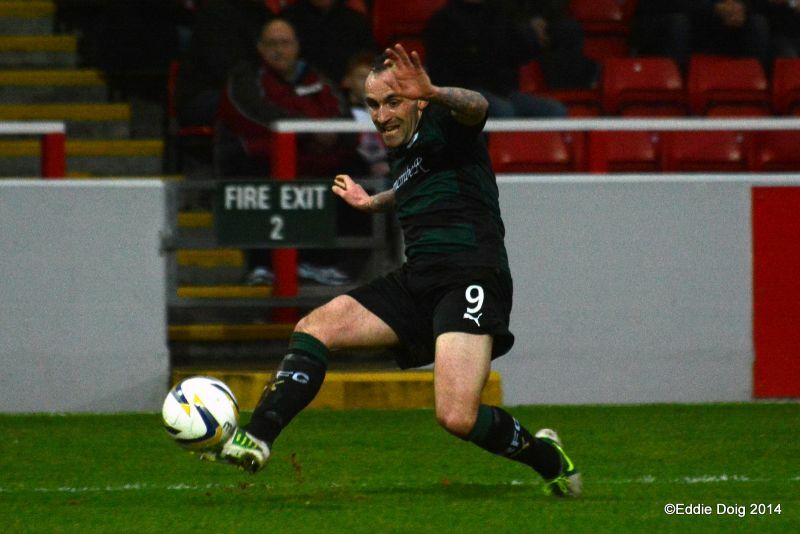 Stirling were lively when able to work the ball into the Raith half. Front-men Doris and Cunningham were ably supported by Smith and Johnston breaking from central areas. The four were able to inter-change such that they frequently found room in the space between Raith’s back four and midfield. 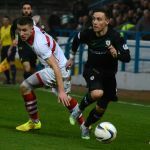 Raith’s midfield shape also allowed considerable acreage in the middle third – visiting scouts must have noted the distance between the wandering Scott and Kevin Moon, which would have been exploited by sterner opponents. In the tenth minute, after good work from Cunningham to squeeze outside Thomson, Doris’ volley should have tested McGurn. 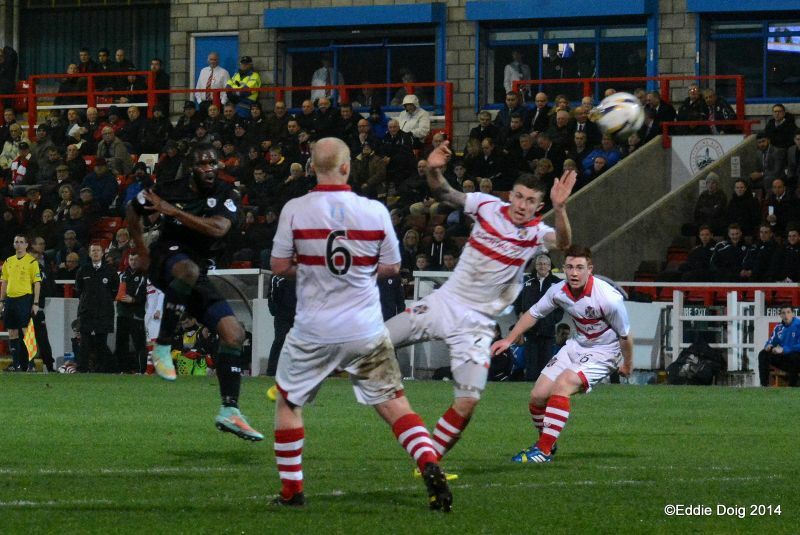 The first-half was lit up by several quicksilver bursts from McKay down Raith’s left. 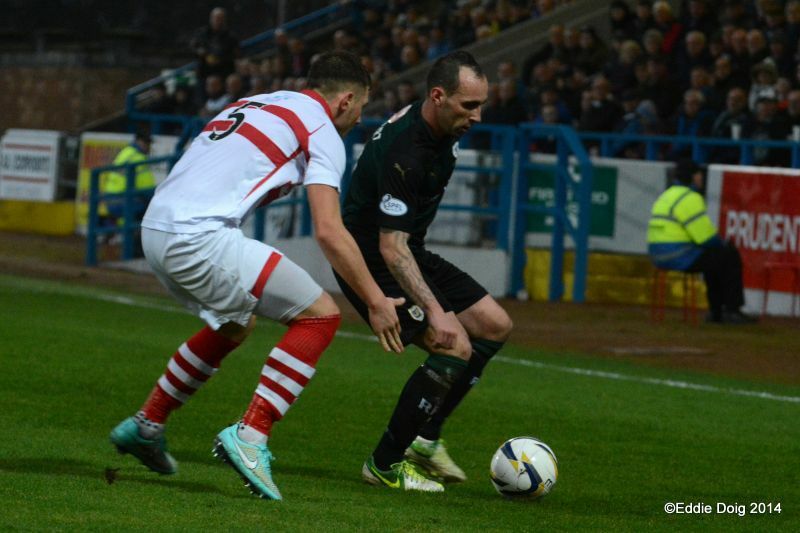 Time and again, Stirling full-back Hamilton was turned inside and out. McKeown and Moon were both able to pin-point the space behind the struggling right-back, allowing McKay to race beyond his opponent. One cross narrowly evaded Stewart, another after a delightful jink between two defenders gave Stewart a further opening, this time his shot was blocked away by a combination of McGeachie and Smith. 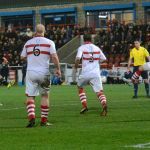 Despite lacking some composure in their own half, Stirling’s attacking prowess belied their poor League form. 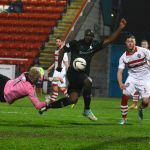 Smith wriggled free from numerous challenges to find Cunningham, whose goal-bound shot drew a tremendous reaction save from McGurn. 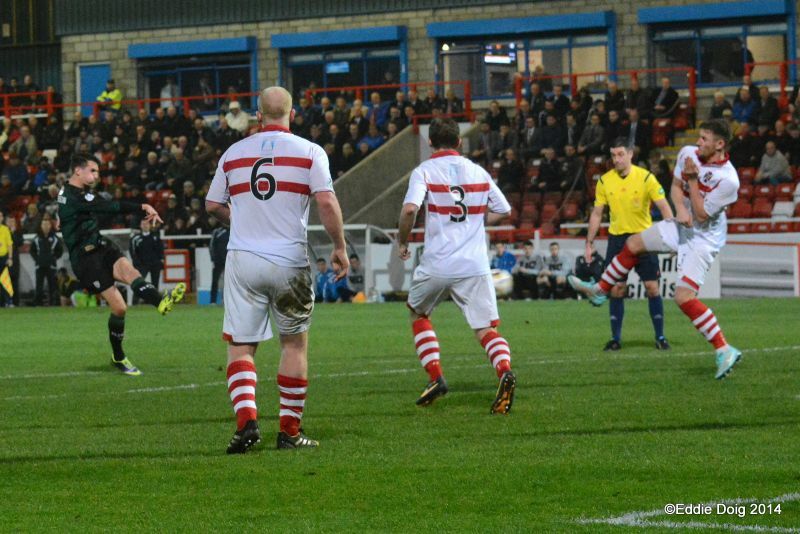 Beith’s shot from twenty yards was touched over shortly afterwards. McGurn – clad in bright orange, on one of the rare days where his usual pink attire caused a colour clash with the opposition goal-keeper – frustrated the home support with several crucial interventions to deny Albion a first-half opener. 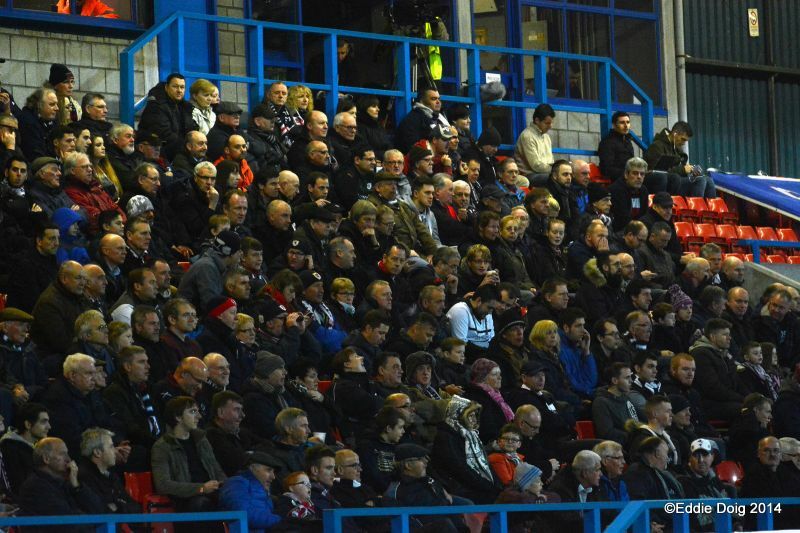 As the half wore on, Raith began to establish a degree of authority over their hosts. With McKay a regular source of inspiration on the left, and Anderson troubling Forsyth on the right, Stewart and Nadé had regular shooting opportunities. 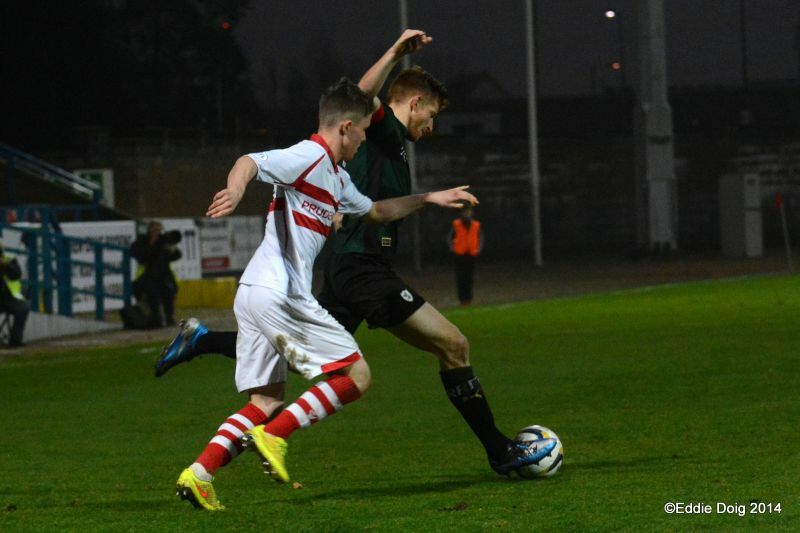 McGeachie did well to block a Stewart effort just before the half-hour, Nadé failed to connect following an Anderson burst, and McClune thumped clear another testing McKay delivery. 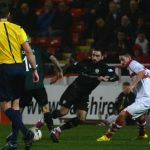 Stirling’s defence also showed frailty in key moments, failing to clear, and gifting possession to Raith when hefty clearances would have allowed the four-man defence to regain some shape. Nadé twisted inside Hamilton and thumped a shot into Reidford’s midriff, McKay released Stewart who was unable to find Nadé with his cross, and another McKay delivery found Nadé only for the Frenchman’s weak finish to offer Reidford welcome respite. 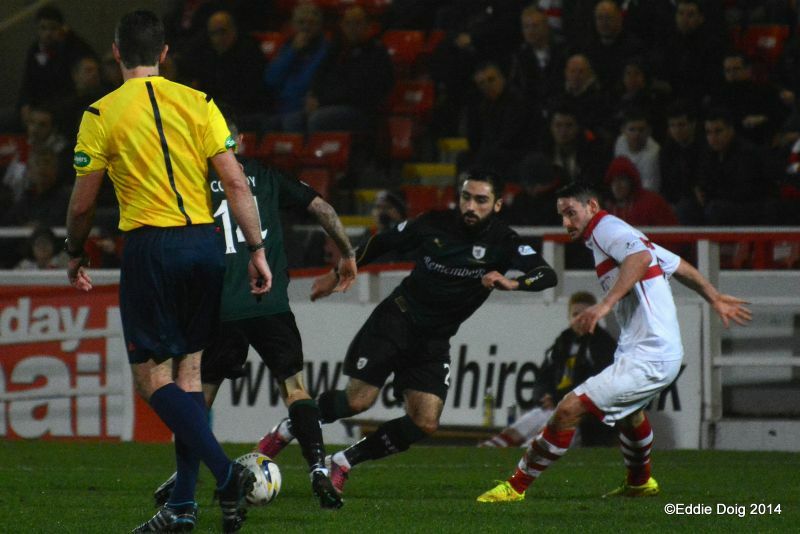 With a minute to go before half-time, Raith took the lead. Barrie McKay found himself in space twenty yards from goal, and had time to place a firm shot low to Reidford’s left-hand side. 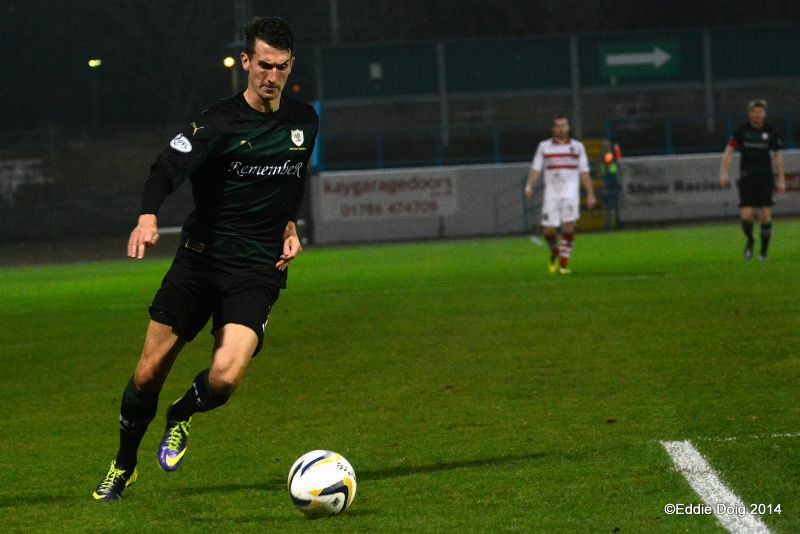 The winger’s all-round play merited a goal, his contribution underlining Raith’s superior quality and confidence in possession. Shortly after half-time, the visitors doubled their advantage. 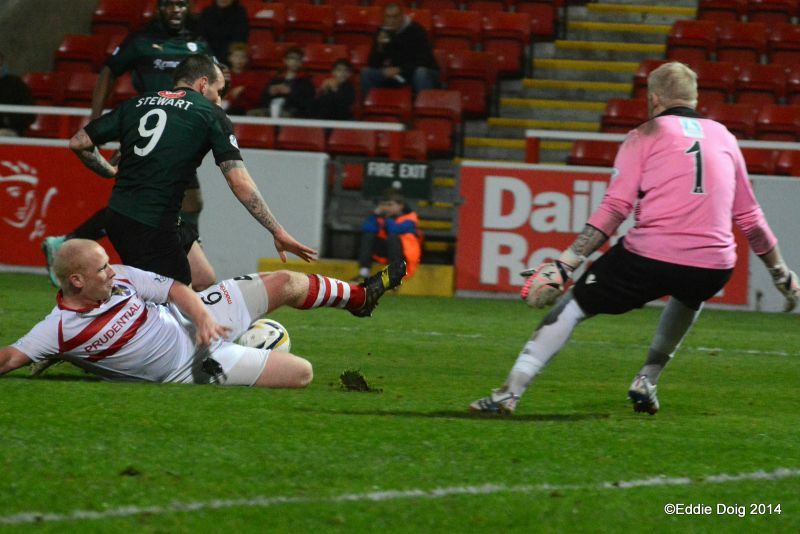 Although the second-half started slowly – a Thomson block from a Smith shot the only incident of note in the opening five minutes – Raith’s second was the game’s moment of genuine quality. 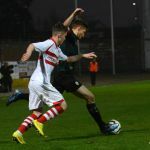 A deep corner found its way to Watson beyond the far post, whose return was partially cleared – Grant Anderson picked the ball cleanly off the heavy surface, smacking a volley twenty-five yards into Reidford’s top right-hand corner. Both sides exchanged good chances in the moments which followed. McKeown marked a rare sortie forward with a fizzing drive which scorched narrowly over Reidford’s bar, whilst McGurn frustrated Cunningham again, saving at the forward’s feet when Doris had released his team-mate beyond Watson and Perry. 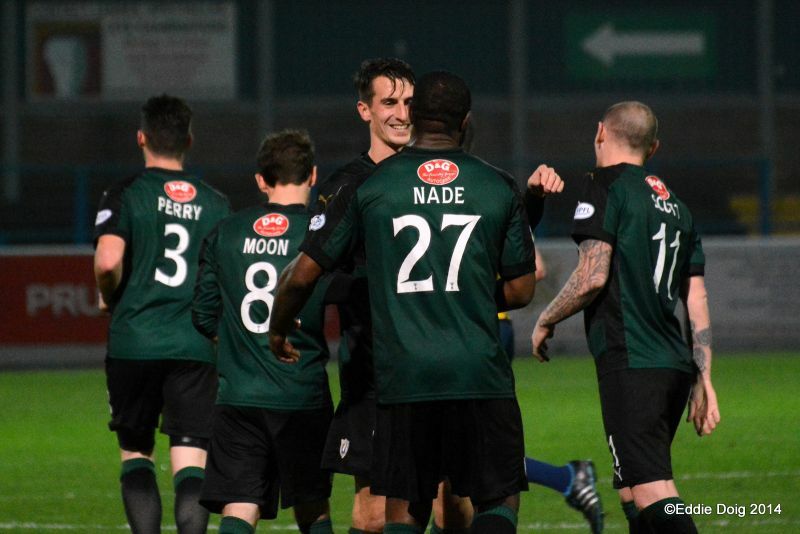 In the sixty-sixth minute, Scott and McKay combined well to cross for Anderson in space – although the Raith winger showed great control to wrong-foot Reidford, a combination of McGeachie and Forsyth prevented Anderson scoring his second with a great goal-line clearance. Moments later, Forsyth’s high challenge on the Raith winger was fortunate only to receive words of warning from referee Aitken rather than a yellow card. 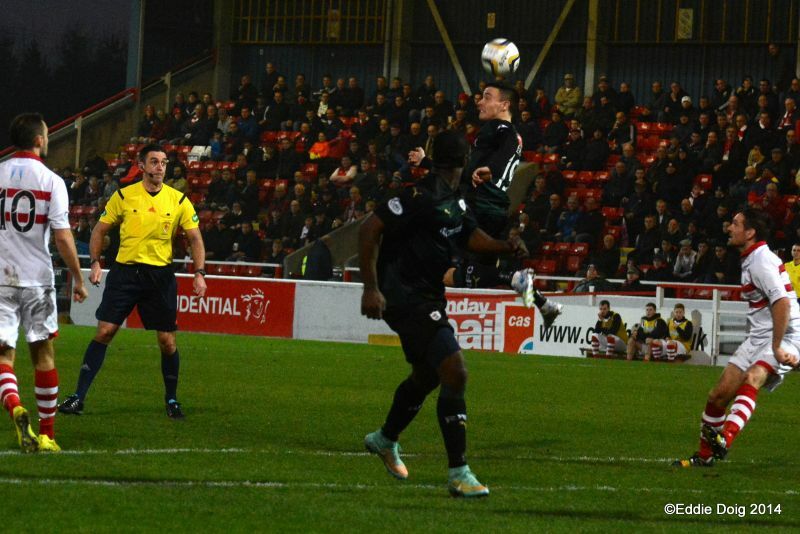 With twenty minutes to go, McKay’s driven corner was met first-time by Perry, whose angled header glanced dangerously beyond the far-post. 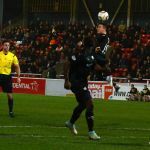 Despite Raith’s control in midfield and the wealth of half-chances they created, the home side had two clear-cut opportunities to cut the deficit as the second-half wore on. With Raith playing a high back-line, Forsyth’s deep ball was collected well by the tireless Doris; his centre picked out Gordon Smith who could only place his finish wide of McGurn’s post. Moments later, Cunningham and substitute Fulton passed their way to the edge of the Raith box, and with a clear sight of goal, Doris’ wasteful volley flew high into the car-park behind the Raith goal. Thankfully for the travelling support, Raith steadied in the closing minutes, and almost extended their margin of victory. Nadé turned and shot impressively on the edge of the area, his drive brushing Reidford’s post; Stewart was nearly played in by Raith sub Conroy, only a timely nudge from the retreating McGeachie allowing Reidford to claim at Stewart’s feet; and Nadé scrummaged the ball and his opposite number into the Stirling net, only for referee Aitken to blow for a free-kick. 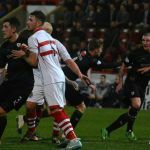 Although the match had never threatened to boil over, there were several yellow cards – the most notable being Beith’s for his cynical trip on McKay. As the game passed the 90-minute mark, Scott jostled with Doris deep in Raith territory. Moments later, with Scott controlling a bouncing ball, Doris flew in late, drawing a yellow card and prompting a reaction from Scott. Booked for his protests, foolishly Scott continued his tirade. 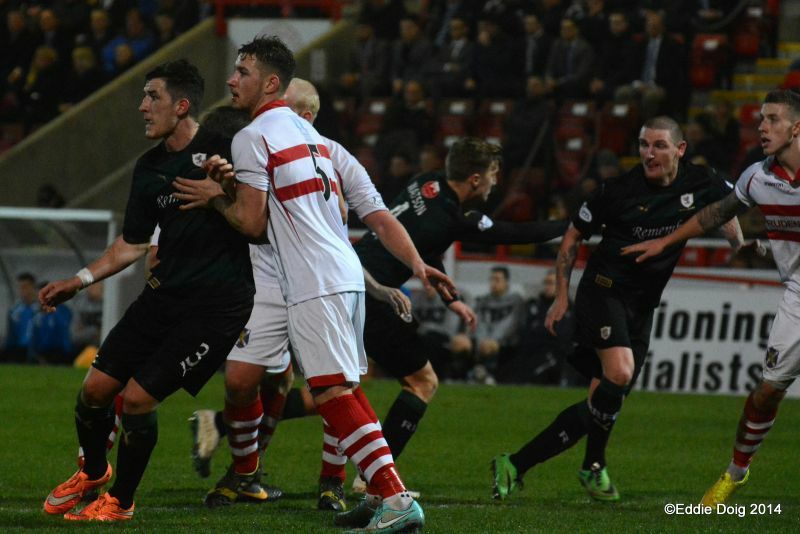 By sensibly withdrawing the midfielder, Grant Murray offered Scott an early bath rather than risk referee Aitken showing a second yellow card. Manager Murray will be pleased taking a comfortable away victory from a fixture which, on paper, looked certain to pose Raith difficulties. With five all-Premier league ties at this stage of the Scottish Cup, and several lower-league sides already through, Raith wait with anticipation for Monday’s fifth-round draw. Welcome to Forthbank for today's 4th round game, where it's chilly but dry and calm. Liam Fox is missing from today's squad, so expecting a 4-4-2 with Scott and Moon in the middle, and Stewart and Nade up front. Gordon Smith starts for the Binos, with ex-Rovers Darren Smith and Craig Wedderburn on the bench. McKay stings Reidford's gloves with a strong shot. Moon broke up play and fed Anderson who ran 40 yards before sending a deep cross in. 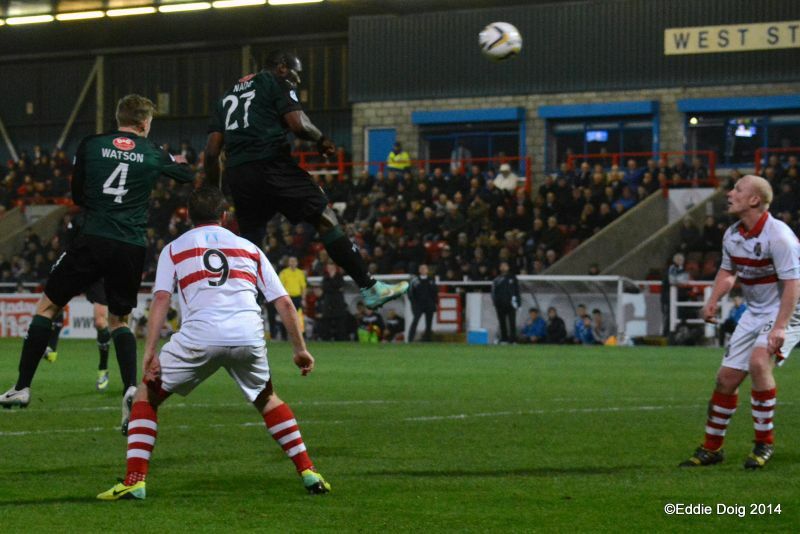 Watson glances a header just wide from a corner, which came after a decent Rovers move to send Nade in on goal. Doris unmarked at the back post volleys over after Cunningham's cross was cleared to him. 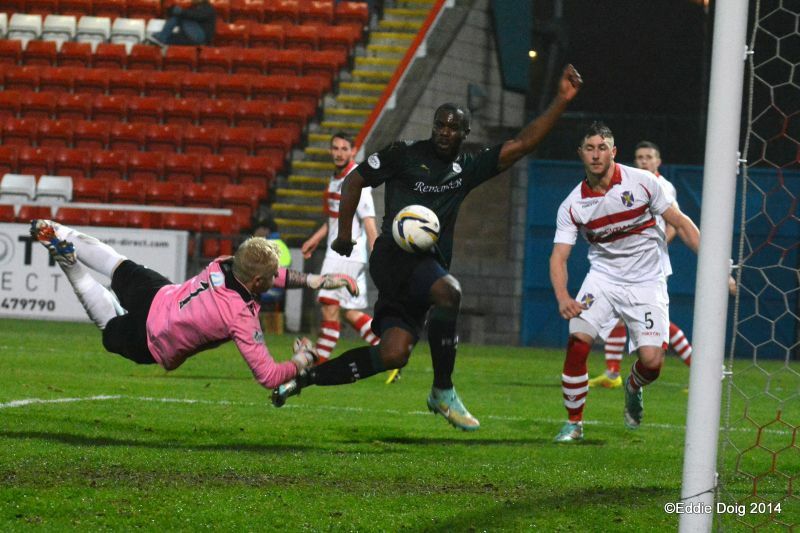 Brilliant play from McKay. Quick feet to nip through 2 midfielders, but his ball to Stewart wasn't quite good enough to send him clear. Thomson charges through the middle after good work from Nade. He threads it through to Stewart whose marker does well to block. Decent 45 minutes of football. 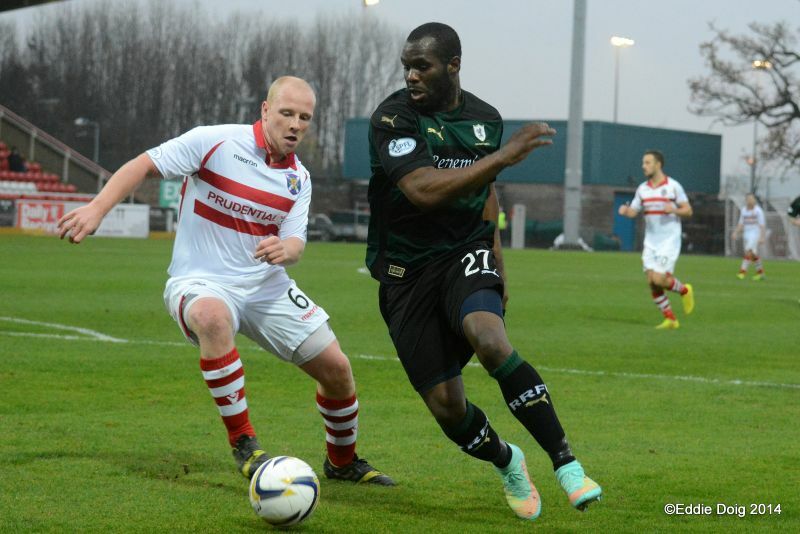 Stirling look better than their league form, and dangerous on the break. 2-0!!! Anderson hammers an unstoppable volley into the top corner after the corner is cleared to the edge of the box! Great shout from McGurn who comes out to his 18 yard line to claim it. Well left by Thomson. Terrific play by Nade! He gets the ball with his back to goal, and with one touch tees it up and turns - his volley grazes the foot of the post! +2 Full time. A deserved win with two great goals from Rovers' best players on the day.